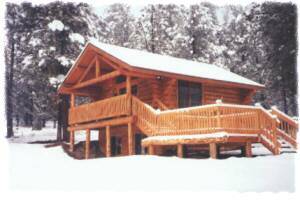 Our new log cabin is nestled in tall pine trees overlooking a meadow and creek on our working cattle ranch. We are located on the Lewis and Clark Trail where they came over the continental divide into Montana nearly 200 years ago. The elk, deer, coyote, bear, eagle, moose, and cougar all call this home as well . There are Big Horn Mountain Sheep that live nearby as well as wolves. Fishing in three major rivers is from 10 to 35 minutes away, as well as rafting, canoeing or kayaking. Located on the Lewis and Clark Trail, just 8 miles from the continental Divide, bordering with Idaho. Nestled in the pine trees overlooking a meadow we have one cabin to insure your privacy and seclusion with thousands of acres of National Forest ground a few feet from your door. We share our special spot with elk, deer, coyotes, moose, bear, cougar, eagles, and occasionally wild turkeys. We are within 30 miles of three major fishing rivers providing great fishing as well as rafting, canoeing and kayaking. Please check out our personal website to see more pictures of the animals and area. Our bath has an oversized shower with washer and dryer located within. The cabinets are handcrafted of the bluepine milled here on the ranch there is a wetbar with stools. Other information about the other living space: The living area and kitchen is one room with vaulted ceiling making it spacious. There is a picnic table as well as a glider on the deck to enjoy the cool mountain air. Personal dresser as well as comfortable chairs in the bedroom. There is a large wooden rocker upstairs as well. A 50% deposit is required to guarantee all reservations. Deposits are non-refundable less than 30 days prior to the arrival date.